This is a rather long read but so little is known about Ghulam Husain Khan here in the US that its worth the effort. Ustad Ghulam Husain Khan was born in Indore in 1927. Since his father died shortly after his birth, he took his musical training from his elder brother, 'Usman Khan. He began by playing the bin, but gradually realized that in the changing musical climate of India the sitar held a more promising future, and he eventually concentrated on the latter instrument in his lessons with his brother. As a general rule when he was young, he mischievously neglected his practice for typical childhood preoccupations (kite-flying, bicycle-riding, and the like). Only after a program in which a cousin was highly praised for a fine performance on the sitar--while Ghulam Husain, wearing (as he vividly remembers) his customary short pants, was sent to fetch water for the guests did he feel a motivation, born of pangs of humiliation and envy, to begin practicing in earnest. With much riyaz and mahnat (practice and industriousness), he progressed rapidly,and was appointed a Court Musician at the age of eighteen or nineteen, shortly before Independence; after 1947 he accompanied his brother 'Usman to Bombay, where he quickly began to establish a reputation as an outstanding sitarist. He remained in Bombay after 'Usman Khan moved to Ahmedabad, and performed there very successfully until he was summoned to Ahmedabad by 'Usman, who was returning to Indore at the invitation of the Maharaja. Ghulam Husain was thus required to take over his elder brother's teaching responsibilities, and he reluctantly left Bombay for Ahmedabad. He was clearly the best sitarist in that city, and he soon developed a considerable, if geographically limited, reputation. He was able to discontinue the classes he had taken over from his brother, and to earn a comfortable income from radio performance, local programs (both public and private), and the private instruction (in "tuitions") of a few wealthy devotees of Hindustani music. While not performing often in other parts of India outside Ahmedabad, he did make a European and American concert tour, sponsored by the Pan Orient Arts Foundation of Boston, in 1968, followed by a second European tour in 1973. His reputation in India has now spread beyond Ahmedabad, and he has performed on one long-playing record released in India and three other records issued abroad. 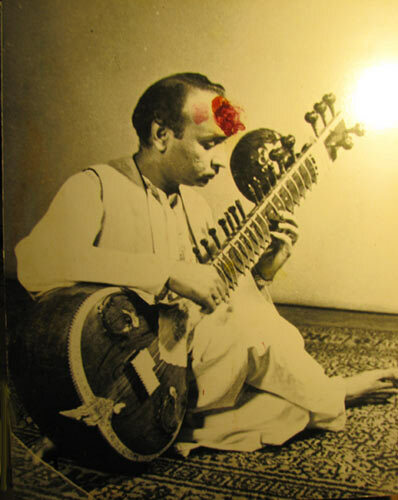 To a great degree, Ghulam Husain Khan has adhered to the traditional principles of ustadi which have already been discussed: riyaz (practice) and mahnat (industriousness); the development of a distinctive style, arising out of traditional elements, in what he calls binkar baj (playing the sitar in the style of a binkar); the maintenance of mithas (musical sweetness) so treasured by 'Usman Khan as the hallmark of the instrumental style of Bande 'Ali Khan; a sense of dedicated khidmat (service) to the gharana; and a basic respect for sadagi (simplicity) in style of life. Moreover, his sense of the traditional instructional roles of the ustad is highly developed; he has not participated in the establishment of any music classes, as have many of his contemporaries, but remains dedicated to the principle of intensive individual instruction and has limited the number of his formally bound shagirds (disciples) to a few individuals who have clearly demonstrated their dedication and seriousness. Patience, obedience, industry, and intelligence are the qualities necessary to a good musician. Through learning the ragas by heart the power to play them comes. One becomes almost hypnotized by the discipline of practice, and this reveals the growth of the inner strength necessary for music. 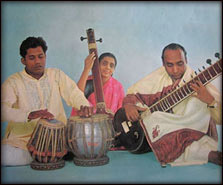 In the development of his sitar style, Ghulam Husain ,as combined the bIn style learned from his elder brother with traditional elements of sitar performance in what he feels is a somewhat novel approach to sitar playing--bInkar baj --thoroughly grounded in precedent in each of the two individual instrumental styles. As already mentioned, 'Usman Khan identifies his bIn style, derived from that of Bande 'Ali Khan, as being distinguished by the introduction of a khaval sensibility and technique into the traditionally dhrupad-oriented style of the bin. Thus Ghulam Husain feels his music to have a strongly vocal quality for which he uses the phrase gayaki ang (used as well by some other musicians, notably Ustad Vilayat Khan) ; and he adds the further qualification that his performance includes elements of thumrI and dadra (forms of light classical music) as well. In the specific flavor of his playing, he, like 'Usman Khan, has tried to maintain the quality of mithas (musical sweetness) through the use of srutitI (microtonal variation), murki (a delicate quaver at the end of a note before a descent), and zamzama (a particular type of occasional tremolo.) His performances are enriched by his knowledge of a large number of old gats ( compositions), including many rare double gats (compositions, in the Raza KhanI or fast pattern, having two parts and lasting two-full-cycles of tIntal, the rhythmic cycle which has sixteen beats) from past ustads in the gharana. Ghulam Husain Khan's sense of khidmat (service) to the gharana is clear. He has remained more concerned than his brothers about the fate of his musical tradition, and a conversation with him often reveals some hope or anxiety prompted by this concern. (This aspect of his ustadi will be treated in an elaboration of his educational philosophy, and in the section on the gharana itself). On the personal level, Ghulam Husain sent his firstborn son, Afzal Husain, to live with and be raised by 'Usman Khan, Who had no son of his own (it was only from a third marriage years later that 'Usman was to have two sons). In fact, out of a general deference toward and sympathy for his older brother (who very much wanted children of his own. ), Ghulam Husain has had all his own children call Usman Khan Babba (roughly equivalent to the English papa), while he himself is addressed as bha'i miyan (respected brother). He also has a clear sense of social khidmat--to be discussed presently--as a citizen of his community in contemporary India. While not an ostentatiously pious man (he has a wry sense of humor and an engaging personal warmth) Ghulam Husain Khan does observe certain principles of sadagi. On almost all occasions he wears a plain white kurta and pa'ijama (loose, flowing shirt and pajama-like trousers) made of simple cotton, neatly pressed. He takes very seriously attendance of ceremonies at the tombs of saints (the roza of Shah 'AIam in Ahmedabad is a favorite visiting place for him), and he prays regularly before his performances. When he was congratulated by a few close friends after a particularly moving and successful debut performance in the United States, he shook his head with stark and genuine humility and said, "maih ne kuch nahin kiya khud ne sab kuch kiya" ("I did nothing--it was all done by God"); one had the distinct impression that he believed utterly that the music had flowed through him from a divine source. The ustad gives his pupil the maximum personal attention possible. He spends from five to ten hours a day with him, until the disciple understands the mind as well as the movements of the teacher. The teaching of music is the creation of a complete understanding between the two. Sometimes the ustad disciplines his pupil to be certain that the disciple is serious. An American boy came to me several years ago, wanting to study the sitar. I was not sure of him so I called him at midnight, at five in the morning, in rain and sun, to test his discipline and patience. Finally I was satisfied and took him. Now he is like a son to me. Ghulam Husain Khan takes his obligations to his shagirds not only as a musical relationship, but as a spiritual and very personal one as well. Certain features of his preceptive philosophy are similar to those of the Sufl tariqa (path), in which the relationship between shaikh and murid often parallels that of ustad and shagird. The aspect or-trial and testing by the ustad shaikh has already been mentioned, as has the aspect of suhbat(literally, company, but in Sufism, spiritual conversation), in which ustad and shagird become well acquainted through extensive conversations and long periods of time spent in each other's company. Writing of the symbolic use of clothing in Sufism, Schimmel (1975:102) has observed that "by donning a garment that has been worn, or even touched, by the blessed hands of a master, the disciple acquires some of the baraka, the mystico-magical power of the sheikh." In numerous instances Ghulam Husain has followed this particular symbolism as well by presenting his male shagirds with both new clothes, particularly kurtas, and clothes which he himself has worn. This last custom in particular is typical of his generosity to his most trusted disciples. much good humor through the servants' entrance. "I am not a proud man," he would say, laughing; "this is the artist's life"--and then, "you must buy tickets to my program. It will be a good program, in a good cause." He sent a very substantial sum received from the concert to the fund, and is still remembered for this in Ahmedabad. Feeling, as many traditional ustads would not, this sense of public interest and duty, Ghulam Husain Khan has thus become something of a patron himself--dispensing, if not money, at least moral and tactical support. During his early days in Ahmedabad, when there was little musical activity in what was primarily the business-oriented center of an expanding textile industry, he was cofounder of "Alap," a music circle organized to bring visiting artists, to the city and thereby enrich its cultural life. He has also participated conscientiously in anniversary programs honoring the memory of two of the major figures in the modernization of Indian music education, V.D. Paluskar and V.N. Bhatkande; in this connection he received a special reception and award, presented by the Finance Minister of India, from the Gandharva Mahavidyalaya Mandal. a well-known modern music school. This last point suggests not so much that Ghulam Husain Khan participates in current trends in the modernization of classical music, as that he wants to acknowledge the fact that such trends exist. To remain informed on various musical developments, he subscribes to at least one musicological journal published in Hindi. In many respects, his reading of this journal has the same motivation as his reading of newspapers: diversion, with an intelligent interest in the events--musical or otherwise of the day. (While maintaining that very little of practical value can be learned from books on music, he does occasionally consult a nineteenth-century Urdu treatise on music, Sarmaya-e-'israt, (sadiq 'Ali Khan 1895) particularly regarding aspects of instrumental maintenance and repairs in which he takes a keen interest. His apparent trust of this book is possibly due to the fact that the author, Sadiq 'Ali Khan, has the same name as the father of Bande 'Ali Khan, the founder of Ghulam Husain's gharana, and may well be the same person. In most respects, Ghulam Husain Khan approaches his public role as an ustad with a particular savor and witty nonchalance that characterizes what he calls "artist's life"--the life of an individual seen, as a Muslim musician, as being somewhat on the periphery of traditional Indian society no matter what the degree of art. When he lived in Bombay, Ghulam Husain moved in a polyglot community of painters, poets, 'and other musicians: he lived for a time in a flat on Malabar Hill where the famous Urdu poet Faiz Ahmad Faiz had recently lived, and which had a history of tenants arrested for offenses ranging from gambling to political terrorism. He still remembers those days and those individuals with pleasure. Yet, coming to Ahmedabad on his brother's instruction, he left the Bohemian life when he realized that it would ultimately be detrimental to his stature as a musician, and to the stature of the gharana, in the public eye; instead of squandering a growing income, he began to invest in the future through the cultivation of a distinct image and selective acquisition of property. Traditionally, Muslim musicians who, before independence, were associated with the courts of princely states, have tended in many respects to imitate the manners and pursuits of their patrons, the Hindu maharajas and the Muslim navabs: hunting, Epicurean dining, a fondness for elegant clothes, and a great pleasure in the adventure of travel. Ghulam Husain is very much of a gourmand, and for some years met regularly with a group of fiends, known as the Murghr (chicken) Club, who would take turns hosting meals In which no effort, and sometimes ( depending on the means of the host) no expense, was spared. During his four-month stay at the University of Chicago, Ghulam Husain cooked sumptuously for his numerous guests, and ate frequently in the city's different ethnic restaurants. Even today, he is fond of going, at five o'clock in the morning, for breakfast to the narrow, smoky, congested street in Ahmedabad known as bhathiyara gali, where bara handi ("twelve pots"--viscid and spice-ridden curries of all edible portions of the goat: brain, tounge, heart, liver, tripe, lung, trotters, and all the usual cuts) is served by the light of kerosene lamps to a motley of dozing Muslim laborers and idlers, and the occasional ustad. Traveling, too, is diverting for Ghulam Husain, who can be an enthusiastic tourist, particularly when he is abroad, unlike some Indian musicians who have difficulty in foreign cultures. As already mentioned, his ordinary dress is simple, though conspicuously long and flowing in its cut, typical of ustads; his taste for clothes worn in performance--still a courtly occasion for him--tend toward pale but expensive raw-silk kurtas and elegantly embroidered Kashmiri woolen shawls, for he believes that if an ustad looks confident and successful, he will more likely be taken as such. This is not to say that Ghulam Husain makes ostentation a way of life. His modest flat in Ahmedabad consists of two rooms and a partitioned verandah; it is located behind a petrol station in the old part of the city, in a large fifty-year-old compound that includes ~ miscellany of families of extremely diverse religious, regional, and even national backgrounds. Nor has his return from his foreign tours significantly changed his style of life. It seems more a function of the passage of time than of self-conscious change that his wife no longer keeps rigid parda (the traditional Islamic veiling of women); that he recently obtained a telephone to facilitate communication with his students, disciples, and friends; that he occasionally wears suits (as he did be: his tours) to social occasions; and that he now eats at small metal table with one or two of his children (though when guests come to his home, tea and dinner are still served on the traditional dastarkhwan spread on the floor.) He remains in touch with most of his close friends of fifteen years ago, though he has made many new friends as well. In all these respects, his life as an ustad has seen not so much a radical alteration as an expansion and enrichment of the traditional roles.